Zeroma, that cat grass is for my cat. Gdaddy, that Verde da Taglio looks SO nice! Does it have deep roots? Will it grow in a shallow say 4-inches of soil? Tormato, I tried to germinate NZ Spinach but I think I soaked mine for too long and killed the seeds. Its been over a month and nothing has germinated. I am kinda scared about the Malabar spinach but I've read to eat it young will solve a lot of the issues?? I definitely will be checking out all the recs in this thread - keep 'em coming and thanks folks! Shallow soil should be fine if you keep the moisture constant. Darkbor kale is a winter crop for us but I'm still picking it in mid-June. It might survive a New York summer. Here's Darkbor about a month ago. It's a bit leggy now but we're still harvesting some. Sweet potato leaves can be very tasty. Interesting. I didn't know they were edible. That would be a double bonus. Tormato, I have grown and eaten Malabar spinach and find it better than that review. I have pretty good luck with black seeded simpson leaf lettuce. Its been growing in my greenhouse since early spring and is just now bolting. We have been really hot, too. There are many sweet potato varieties selected for their leaves. The one I am growing is Beauregard. Is that one edible? Beauregard is an excellent sweet potato! Concur with amaranth, sweet potato leaves & New Zealand spinach. NZ spinach can be very slow to germinate unless pre-soaked, and the tiny seedlings can easily be mistaken for weeds. The plants are not only heat tolerant, they will take a few frosts. I agree with the blanching recommendation. Egyptian spinach (or molokhia) is another good hot weather green, it is on the left side of the photo above. An upright, heavily-branched bush. The leaves are mucilaginous (like okra) and somewhat bland, but it is good with fish, and the dried powdered leaves can be used as a soup thickener. The young leaves are mint-like in appearance, deep green, tender, and can be used raw in salads. My favorite hot weather green, though, is water spinach. It grows across the ground very much like miniature sweet potato vines (it is in the same family). The tender vine tips & the first few leaves are harvested. The more it is cut back, the more branches form. Filipinos call it Kang Kong, and I like it cooked & seasoned with soy sauce, vinegar, and garlic powder. The plants thrive in wet soil... but in some of the warmer states, it is classified as a noxious weed, because it is a water-borne invasive. Seeds are hard to come by, but shoots are often sold in Asian markets, and those can be rooted. The last hot weather green I could recommend is Moringa oleifera - which is actually a small tree. The tiny leaflets are eaten, and are very nutritious. I grow them each year from seed & transplant them into the garden; but it can also be grown in pots & brought indoors for the winter, or left outside in frost-free zones. It will not produce as heavily as any of the greens above, but it is worth growing for its health benefits. The trees need well-drained soil, and will languish or die if waterlogged. If grown as an annual, the trees can be spaced much more closely than in the photo. zeedman, I think I was having a convo with you about kang kong seeds before... have you tried to room them? I can buy them from my grocery store... and then what? If you are container gardening, you could plant the seeds directly in the container when the soil has warmed. However, I recommend starting the seeds in cells, with soil less starter mix. The germination rate from packaged seed can be very unpredictable, especially for the wide-leaved variety. Starting the seeds as transplants gives you better control over the soil temperature (kang kong can germinate very slowly in cool soil), and you can have better plant spacing if germination is poor. Plant the seeds about 3 weeks before you intend to transplant. I use 96-cell plastic inserts, and place 3-4 seeds in every cell. The seedlings are small, and even if all the seeds germinate, they don't mind being crowded... so I transplant all the seedling in the cell together. Some seeds will germinate later, so don't be surprised if new seeds are still germinating 2 weeks after the first ones. You will probably find that many seeds emerge with "helmets"... keeping the soil moist will reduce this. When the seed coat sticks, drop or spray water on it, which will soften it & allow the seedling to (usually) break out. When germination begins you will probably need to do this at least once a day (and preferably twice) until no new seedling emerge... a bit of a pain, but you will get many more healthy seedlings. The seedlings need intense light, so they must be grown under strong artificial lighting (I use a 6-bulb T-8 fixture), or in direct sunlight. If your seed came in an envelope & you intend to save some for next year, I recommend placing it into an air-tight container, and removing as much air as possible. In an envelope alone, it will only remain viable for a few years. The seed I am using is over 10 years old, and still has good germination. In the garden, the plants can be spaced quite close together. I plant the seedling clusters in 12" squares, with a cluster on each corner & one in the middle... that is the spacing used in the photo. You could probably use similar spacing in containers. -Swiss Chard: Bright Lights, Perpetual Spinach, Verde de Taglio. Discontinued: Fordhook Giant (extremely chalky mouthfeel). Verde de Taglio may beat out Perpetual Spinach! Super tender, mild leaves. First year growing that one. 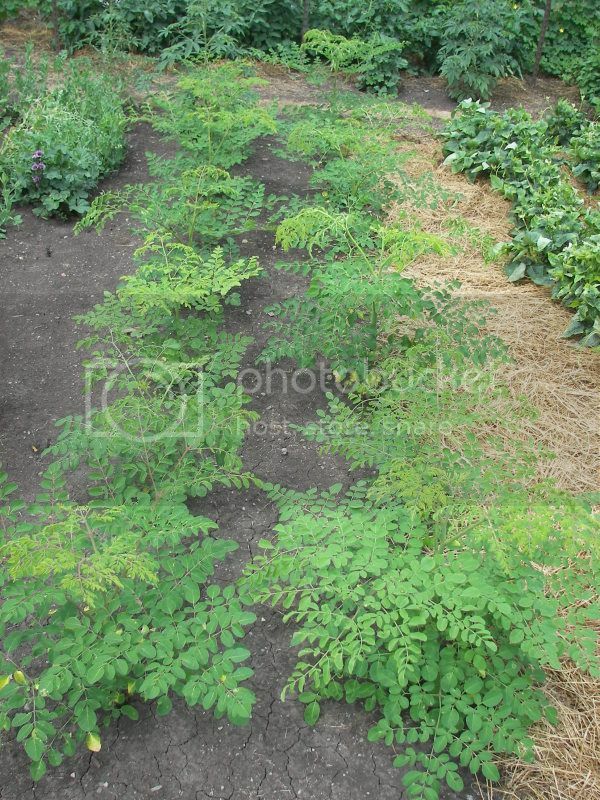 -Dwarf Moringa: first year growing, need to improve drainage in soilless mix, they are not doing so great, tips of leaves brown. Probably need to trim taproots as well. Seedlings less than 1' tall in half gallon containers. Potting up to 1 gallon this weekend. -Kang Kong: first year, I am excited about this one. Growing like weeds. One of my favorite veggies. Ebay seeds, variety that grows well in soil. -Malabar Spinach: third year? Only need to buy seeds once and you will have this plant forever. Flourishes in heat, loves 100 degree days. Larger leaves have too slimy a texture but small leaves good raw. Red variety. -Okinawa Spinach: has slowed down in the heat but no wilting. Might need part shade. -Longevity spinach: still showing fast growth in full sun. -Tuscan Kale: many online comments say it does not do well in hot weather, but mine is far more heat tolerant than other varieties I have tried. My Red Russian plants are currently taking a beating (will wilt in middle of day) but the Lacinato is putting out lots of leaves. Starting to get bitter raw. -Sorrel De Belleville: tasty if you like sour lemons. Still doing great in our high 90s weather. I am moving it to part-shade this weekend. Virtually maintenance-free. Very tender, spinach-like texture. Bugs do not touch it. -Chinese Kale: first year, these are done. Will try again this fall. -Bull's Blood Beet: I give up. Tasty leaves but I never get good summer production. Have tried two different seed sources. Plants have completely stalled since temperatures reached the 80s. Have not been able to harvest leaves in a month. Will only plant in fall from now on. 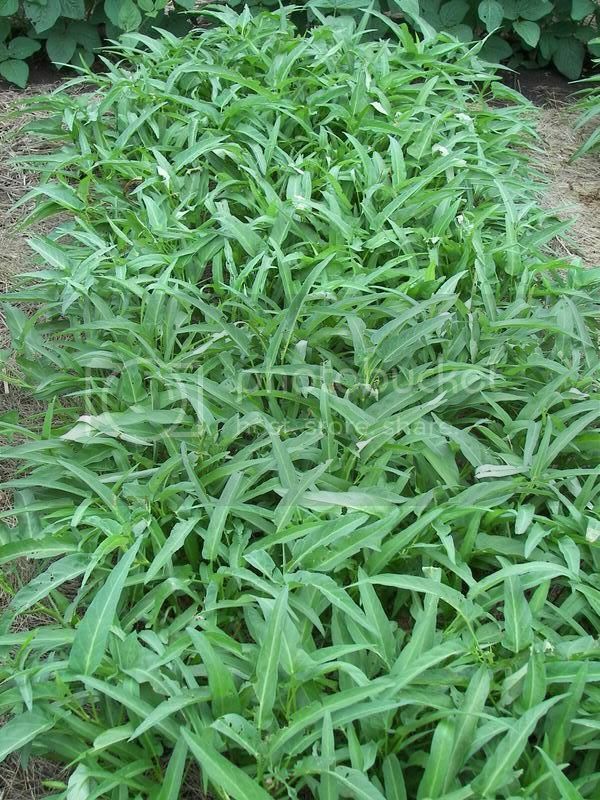 -Sylvetta: perennial arugula, needs shade in hot weather, only getting a few leaves per plant each week now. Worth maintaining for a cool weather payoff. -Orach: Another year of disappointment. -Shiso: poor germination, weak seedlings. Need new seeds. 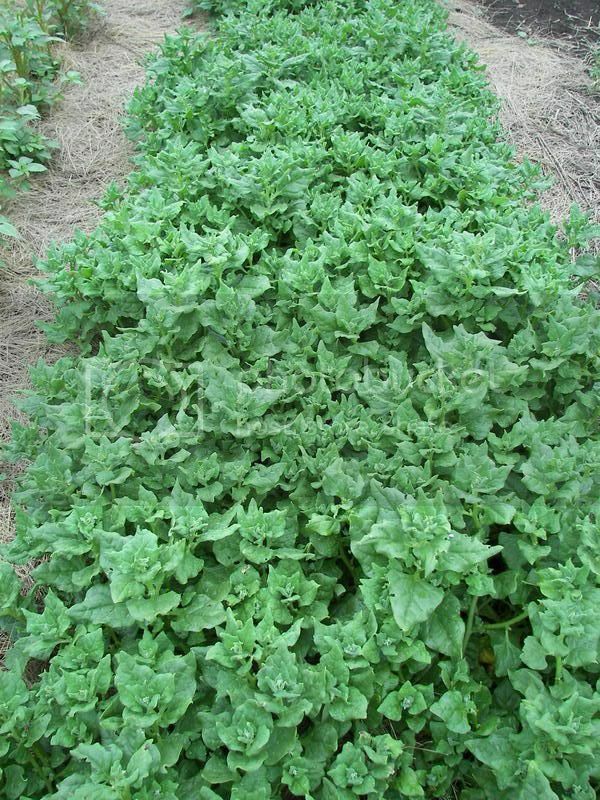 -New Zealand Spinach: Zeedman, that is one fantastic-looking row. I haven't tried this one yet since it doesn't get the best taste reviews. -Egyptian Spinach: I have avoided this plant since it is always followed by a description along the lines of "Slimy like okra". Even purslane can be too slimy for me sometimes, but I could try drying it into a powder. -Taiwan Swordleaf Lettuce: not sure how heat tolerant. -Amish Deer Tongue Lettuce: supposedly slow to bolt and grow bitter. -Tokyo Bekana: claimed to be heat tolerant. -Senposai Select: reviews say produces well in summer. -Nagaimo Sweet Potato: Supposedly the purple varieties (Ipomoea batatas) have the best-tasting leaves, which are lower in oxalic acid than spinach. I'm not sure the Nagaimo would do well in containers, although it seems cutting may not produce the huge tubers. Looking for recommendations! Not in this list are collards. Many of the varieties I have grown are heat tolerant, but get bitter in summer. I'm taking the year off from collards (and all but a few kale plants) to reduce some persistent pest issues. Portuguese Tronchuda did fantastic last year in hot weather, better than Georgia and Alabama varieties.